Experience the unexpected! This is a reaction trainer with a difference (Sane and insane sides) The ball returns erratically, testing and improving your reactions and hand-eye co-ordination. 11 of the 15 squad have coached at net-it camps and 5 and coaching for us this Summer! 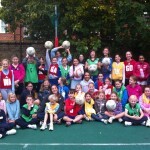 net-it are dedicated to offering inspirational netball, hockey and rounders coaching and development camps to players of all abilities at camps in schools, colleges and clubs around London, Surrey, Sussex, Berkshire, Hampshire and Kent.